The Bridesmaid Season is a series I've been thinking about for some time, after having had the pleasure of being a bridesmaid four times (and counting!). It is a wonderful honor but it also comes with a bit of pressure - you want to create a memorable season for your bride and throw her a bomb bridal shower and bachelorette party. But as we know, anything wedding related can be costly and the costs can add up quickly. If you do have a tight budget - don't worry! You will just have to be a little creative and put in the time to DIY! I wanted to share some of my ideas and the projects I have done in the past, targeted specifically to those bridesmaids that are willing to DIY but don't know where to start. I hope some of you find some inspiration from this series! When I was thinking of ideas for my bestie's bachelorette party, I wanted her to wear something for her bachelorette weekend that was NOT the typical sash or tiara - she is not really a tiara kind of girl. Flower crowns are nothing new to the wedding game (our bride-to-be had worn a flower crown at her bridal shower that we had made using real flowers), but I thought this would be unique for her bachelorette weekend and be more suited to her style. I made her bachelorette flower crown using faux flowers so that it would survive the weekend, and also added a lace and ribbon veil to make it more festive. We were in Vegas for her bachelorette party and she definitely stood out from all the other brides-to-be, and she got compliments all weekend long! This project is super easy, budget-friendly, and only takes about 30 minutes. There are hundreds of flower crown tutorials online, this is the way I make mine! I bought 3 different sized white flowers - make sure the flowers you pick aren't too big! I made the mistake of using huge white flowers the first time I made this, and although it had pretty sweet Lana Del Ray vibes, it was very heavy and I felt bad for the bride-to-be (sorry Crystal)! Don't make that mistake! Cut your flowers using the wire cutters leaving about 1-2 inches of stem. If the flower head can pull off from the stem, do so. Use the glue gun to reinforce the flower head to the stem by adding glue to the tip of the stem and pushing the flower head back on. 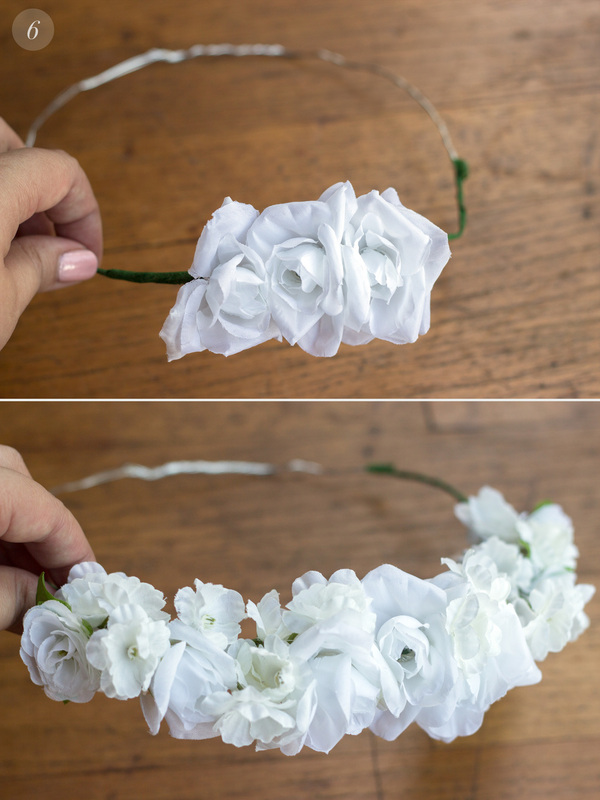 This will lesson the chances of the flower heads popping off - you want the crown to be durable enough to withstand all of the dancing and whatever other activities may be happening that weekend. Measure the size of your head with the wire. Go over the wire again, twisting as you go. If you aren't sure about the size for your bride, err on the larger side. When it is finished, you can always adjust it to make it smaller but you can't make it larger! Pick 3 of your largest flowers, this will be your focal point. You can have the focal point be in the center or to the side, whichever you prefer! Affix the flower to the wire using the floral tape. Try to get as close to the flower head as possible, and pull the floral tape tight as you wrap around the stem and down the wire. After attaching your focal point flowers, start adding flowers on either side, switching sides as you go to maintain some symmetry. The flowers should get smaller and more spaced out as you make your way around the crown. Leave a few inches at the back of the crown for your veil, and wrap the remaining wire in floral tape so the wire is completely hidden. Cut your ribbon so that it is around 8 feet long. Tie the ribbon to the crown, once it is tied the ribbon will hang at approx. 4 feet. The more variety of ribbon, the better! And that's it! How easy was that. Simple and quick, and I love that the bride can enjoy this as a keepsake.